Arab Satellite Communications Organization announces that Africa 24, the news channel for Africa, already present in France and in Sub-Saharan Africa, has selected ARABSAT to expand its coverage and launch in French on ARABSAT Badr-4 at 26°E to cover the entire Middle East, North Africa and portions of Western Europe. 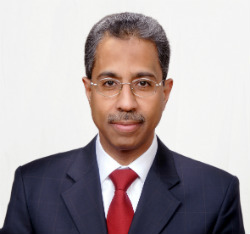 Khalid bin Ahmed Balkhyour president & CEO of Arabsat stated, "We are very pleased with the new partnership with Africa 24 and deeply appreciate their confidence in ARABSAT satellites technical capabilities. We look forward to strengthening this partnership, and provide our full support to Africa 24 to develop and expand its broadcast and coverage, and we wish them best of luck. " With the exclusive launch of AFRICA 24, ARABSAT continues to offer the best African programming line-up in the Middle-East and North Africa,” said Constant Nemale, President and Founder of Africa 24. “AFRICA24 is completely aligned to ARABSAT Network’s continuing commitment to offer the most attractive African programming options to the diverse African communities at the best value. ” added Constant Nemale.